Over the years, many of Newark's best-known emblems and symbols have disappeared, only to reappear in different settings. Often, they also have been dedicated to new purposes. In some instances the transformation has been legitimate. Sometimes it has not. Fortunately for Newark, and its long decorative arts history, there has been a Newark Museum dedicated to the preservation of the best of the city's past. Ulysses Dietz, curator of the decorative arts department at the museum, reports that part of our Colonial history has been preserved in its Newark-made silver and porcelain collections, and that the paintings by Rembrandt Peale and Oliver Tarbell Eddy are like windows opening onto Newark's past. Also included in the collections are statues of Captain Jinks, once of Broad Street, the old Prudential fountain now in the museum garden, and the very centerpiece of the collection, the Ballantine House, which includes John Jelliff furniture, Keumeich stoneware, and Unger and Tiffany silver and jewelry. The entire three-floor, 15-room house is a museum within a museum, containing the best of locally manufactured and collected items. Not all the symbols of the city are housed at the museum. Two statues once well known to Newarkers were the wooden and stone firemen that stood guard over the two former Firemen's Insurance headquarters at the Four Corners. The first one, a wooden piece carved by John Campbell of Belleville, stood atop the original Empire-styled building from 1868 until 1909. When the building was demolished, it ended up on the rubbish heap of the old Salvage Corps. But it was rescued by a visiting fireman from Butler, who spirited him out of the city at night in a wagon covered with blankets. After being repaired, he was relocated to the front of the Butler Borough Hall. The second firemen's statue was of stone, perhaps marble, carved about 1909 by Paul Wiehle of New York at a reported price of $3,000. It was created to fill a niche over the west entrance of the new 16-story Firemen's Insurance Co. He took his vigil until about 1929, when several of the building's tenants demanded his removal, his only sin being that he blocked their view of Broad Street. This fireman met the same fate as his wooden predecessor on the scrap heap. In 1932, a former Bloomfield councilman, an exempt fireman, paid $25 to transport the statue to Bloomfield, where he now occupies a position of honor at the fire department. Not all our lost symbols have disappeared through obsolescence or neglect. Some have been stolen right out from under our nose. In the late 1970s, after the library's side yard fence was demolished by a runaway car, two large classical bronze busts were reported missing. They were copies of Jupiter and Zeus, from originals in the Vatican garden, given to the library in 1912 by J. William Clark. Both statues were taken by a thief who had access to lifting devices and knew what he was doing. A similar incident in 1980 involved the loss of the 'Hiker' monument at McKinley Circle at Clinton Avenue and Irvine Turner Boulevard under the cover of darkness. The 6-foot, 66-year-old, 1,200-pound bronze was lifted off its granite base, and its bronze descriptive tablets were removed. ''The Hiker' was created in 1907, dedicated to the memory of Newarkers who had served with Teddy Roosevelt in the Spanish American War. It was carved by Allen O. Newman and paid for by Newark veterans. During the theft its arms and legs were chopped off for scrap. The torso was later located in a Hunterdon Street basement tenement. Other losses include the cannon ball chain and railings around the Washington statue and the head of the statue of the Puerto Rican liberator from Washington Park. For more than 100 years, Broad Street and the downtown area have been home to well-known commercial signs that reflect Newark's commercial life and activities. Some of these signs have disappeared, while others have found their way into collections at the Newark Museum and the New Jersey Historical Society. Others have been recorded on the canvases of artists such as Adolf Konrad, Michael Lenson and Henry Gasser. In addition to the cigar store Indians that appeared in front of several Newark shops, the mid-19th century figure of Captain Jinks, based upon a popular song, was a familiar sight at Broad Street's southeastern corner for many years before Feary's Cigar Store closed. Afterward, it was relegated to storage. Herbert E. Ehiers, city editor of the Sunday Call, got the statue to the Newark Museum in 1924, where it became the symbol of Junior Museum activities. According to the old New Jersey Freie Zeitung newspaper, Jinks was a satirical portrait of Austrian Emperor Franz Josef. Other copies can be found in Coldwater and Grand Rapids, Mich. – and even in my office. For 92 years, a huge carved arm and hammer was located outside 498 Broad St. before it was moved to the Bridge Street side of the building. It was carved by Henry Higgins of Greenwood Lake and measures a whopping 34 inches around the bicep. The arm was designed to advertise a store selling working clothes. Later, it was the logo of the Katzin store. For years, the museum had its eye on the sculpture, described by former curator Margaret White as 'true art.' Eventually, it was added to the museum collections, along with Captain Jinks. For years, a sculpture of the mythical 13th century Flemish creator of beer was a landmark at the old Hensler Brewing Co. in the Ironbound. The nine-foot statue, which held a sword on his hip and a goblet extended to viewers in his right hand, was to many the very symbol of Newark brewing. During his 70 years at the Hensler Brewery, Gambrinus once fell from his perch, but was replaced. After Hensler's closed, the statue was moved to the Krueger Brewery and was refurbished. Legend held that when Prohibition went into effect, his foaming goblet dropped from his hand and smashed on the pavement below. When Krueger closed, the building was purchased by an office supply company. Again, the statue disappeared from public view. One of the handsomest sculptures in town is the American eagle once located on the third floor facade of the old American Insurance Co. on Park Place, now the northwest corner of the PSE&G Plaza. For many years the three-story building designed by Cass Gilbert served as the auditorium for PSE&G's rambling 12-story office complex. Today, the three story structure is gone, but the eagle remains on a pedestal in a park-like setting surrounded in spring by daffodils, rich green trees in summer and an occasional spray from the nearby fountain and waterfall on a windy day. According to a company report, PSE&G intended 'to install a piece of its past in the plaza.' The three-ton eagle, which sat flush against the original building was slightly reshaped by Rene Lavaggi to give the wings more roundness. Despite the demolition of the castle-like Prudential buildings along Broad Street in 1956, several important decorative elements from them were preserved. The 11-foot Gothic-Romanesque fountain, which stood for a half century at Broad and Bank streets, was installed in the Newark Museum's Alice Ransome Dreyfuss Memorial Garden behind the main building. The two lions supporting the shield over the front door of the main entrance from 1901 to 1956, made of Indiana limestone and carved by Karl Bitter, were donated to the Essex County Park Commission by Carrol M. Shanks, Prudential president. Each figure, portrayed in a sitting position with teeth bared, now occupies one end of a broad staircase in a concert grove facing the lake. The eight gargoyles of the old Prudential building, once on the 10th floor, guarded the downtown complex before its demolition. Each weighed 1,900 pounds and was sent to all the company's regional home offices. They were patterned after a Loire Valley chateau, supposedly designed to ward off evil spirits. Crafted by stonecutters from the United States, France and Italy, each had a dragon's head and demon-like face. Unlike the old Prudential center on Broad Street, the Lyons Farm School, Newark's oldest school building, was not demolished but simply moved from the south end of town to the protection of the Newark Museum garden. It was carried stone by stone and rebuilt as it had originally appeared in 1784. The dedication in the Museum Garden was attended by Dr. William R. Ward of Chancellor Avenue, a descendant of the early Ward family of Weequahic, and Miss Ida L. McCloud, a teacher in the school from 1877 until 1880. Few Newark buildings can claim such a long history. Like the Ballantine House, the safety of this structure has been guaranteed because of its inclusion within the physical confines of the museum complex. Probably one of the most talked-about structures of Newark to be built in the 20th century is the Newark Traffic Tower. In recent months Councilman Luis Quintana has argued that the structure should be returned to Newark and placed on the grounds of the New Jersey Performing Arts Center because of its historical ties to the city. A study by Henry M. Brinckerhoff of Parsons, Klapp, Brinckerhoff and Douglas of New York stated that traffic at the 'Four Corners in Newark was traffic better than that at Fifth Avenue and 42nd Street, ' calling the Four Corners 'the busiest traffic center in the world.' That statement was substantiated by the following figures. In a 12-hour period on Oct. 2, 1926, 36,596 vehicles passed through the corners, including 2,844 trolley cars, 4,098 buses, 124 horse-drawn vehicles, 2,675 taxicabs, 3,474 commercial vehicles and 24,581 passenger cars. The Newark Traffic Tower was in operation from 1924 to 1939. 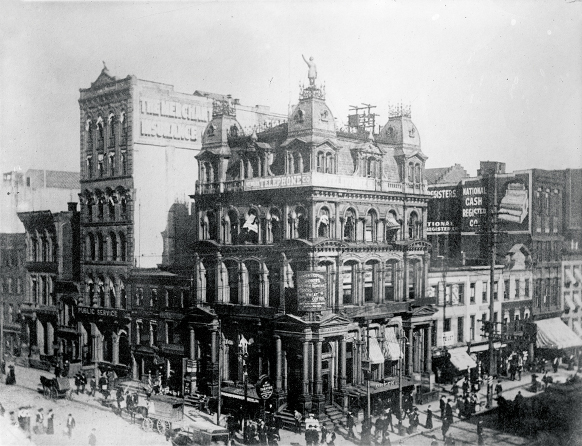 Its construction was sponsored by the Broad Street Association, chaired by William H. Halsey. Once in use, it regulated traffic from the Lackawanna Railroad (the Broad Street Station) on the north to Lincoln Park on the south. The tower, designed by Nathan Harris, essentially was a steel frame structure 24 feet high covered with bronze and mounted on solid concrete that lifted it 19 feet above the pavement. Below the light was a room 4 feet square and 7 feet high from which the officer in charge of regulating traffic had an unobstructed view of Broad and Market streets. A collapsible ladder folded into one of the tower legs. The entire cost: $19,000. To the patrolman, time spent in the tower was a torturous affair. To the traffic planner, it was an answer to massive traffic problems, and to the nostalgic Newarker, past or present, it was a little bit of the 'good old days.' Whatever the case, the tower, or a replica, may just be coming back to Newark, possibly on the grounds of the New Jersey Performing Arts Center.